Wesbank released its latest commentary on the August vehicle sales figures released last week. According to the vehicle financing company's analysis of the Naamsa figures, the new vehicle industry’s sales performance continued on its downward trajectory last month. 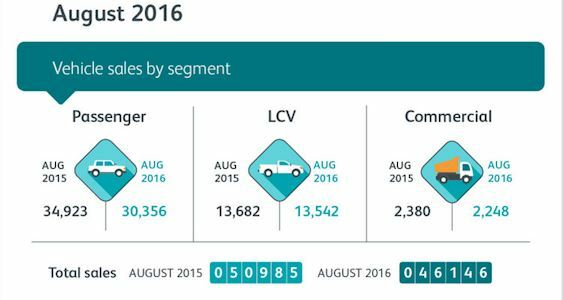 The industry achieved sales of 46 146 vehicles in August, a year-on-year decline of 9.5%. Passenger sales remained weak, with a 13.1% decline, while light commercial vehicle (LCV) sales remained resilient with sales down only 1%. The majority of consumers purchase cars through the dealer channel, which saw passenger and LCV sales fall 18.1% and 5.5%, respectively. Sales through the rental channel grew slightly, year-on-year, at 0.8% – in line with rental companies renewing their fleets. Year-to-date, sales have fallen 10.5%, drawing on from WesBank’s 2016 forecast which anticipates the market to be 12% down from last year. WesBank’s data also indicates that August’s weak new vehicle sales were driven by this year’s predominant trend: customers shifting to the used market. A total of 133 094 vehicle finance applications were received last month – year-on year growth of 3.7% – and the highest number of applications received for any month of 2016, so far. However, within this there was an 11.1% decline in applications for new vehicles, due to the shift to the used car market. Here, demand for used vehicle finance grew 11.2%, resulting in the used-to-new vehicle ratio growing to 1.67:1. Buyers financing new vehicles are spending more than ever before, with the price of a new vehicle financed in August at nearly R297 000 – an increase of 13.4%, year-on-year. Demand in the used market drove up prices of pre-owned cars by 9.2% during the same period, with the average used deal now sitting at just over R190 000.